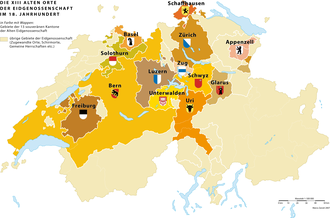 Many languages are used within the state. For instance, recruits to the Pontifical Swiss Guard take their oath in the language of the canton to which they belong: German, French or Italian. And the Holy See's semi-official newspaper, L'Osservatore Romano is published in Italian, English, French, German, Polish, Portuguese and Spanish. A Malayalam edition was added in July 2008. The Holy See itself mainly uses Latin for its most important official documents, which are published in the Acta Apostolicae Sedis. Since the state came into existence only in 1929, most of the buildings situated within it predated it by centuries: inscriptions can be found in them mainly in Latin, but also in Italian, Greek, French and German. What became Vatican City was from 1870 to 1929 part of the Kingdom of Italy, whose official language also was Italian, and before 1870 it was part of the Papal States, in which standard Italian (based on Tuscan) and various Italian dialects, such as Emiliano-Romagnolo, were spoken, but which for the first centuries of its existence used Latin for all official purposes. Earlier still, it was part of the Roman Empire. 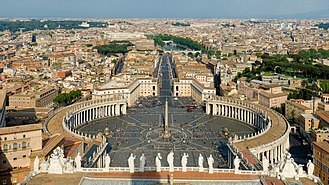 In the earliest historical records the term "Vatican" was used to refer to a marshy area, larger than the Vatican City State, on the right bank of the Tiber River, between the Milvio Bridge and the present Sixtus Bridge. 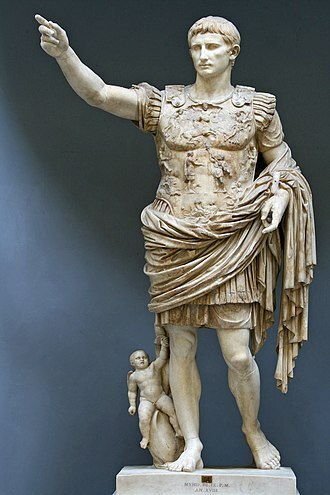 During the monarchy and the republican age, the area was known as Ager Vaticanus. From the 2nd century A.D., the toponym Vaticanum was applied to an area corresponding roughly to the present Vatican City State. ^ The text of the first seven items published in that supplement is given here. Archived 2010-12-27 at the Wayback Machine. ^ Vatican City in the Past Archived 2008-03-17 at the Wayback Machine. Tuscan is an Italo-Dalmatian variety mainly spoken in Tuscany, Italy. It would become the language of all the Italian states. Tuscan is a complex composed of many local variants, with minor differences among them. The main subdivision is between Northern Tuscan dialects and Southern Tuscan dialects, the Northern Tuscan dialects are, the main dialect of Florence and the Mugello region, spoken in Prato and along the river Arno as far as the city of Fucecchio. Pistoiese, spoken in the city of Pistoia and nearest zones, pesciatino or Valdinievolese, spoken in the Valdinievole zone, in the cities of Pescia and Montecatini Terme. 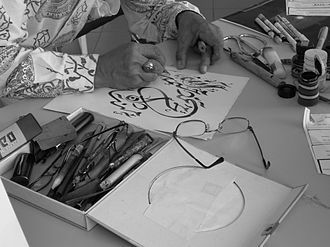 Lucchese, spoken in Lucca and nearby hills, spoken in the historical area of Versilia. Viareggino, spoken in Viareggio and vicinity, pisano-Livornese, spoken in Pisa and in Livorno and the vicinity, and along the southern coast as far as the city of Piombino. The Southern Tuscan dialects are, Aretino-Chianaiolo, spoken in Arezzo, spoken in the city and province of Siena. 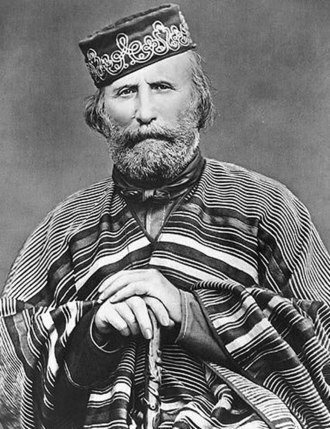 Grossetano, spoken in the city and province of Grosseto and Gallurese, Corsican on the island of Corsica, and its variety spoken in Sardinia, are classified by scholars as a direct offshoot from medieval Tuscan. Excluding the inhabitants of Province of Massa and Carrara, who speak an Emilian variety of a Gallo-Italic language, the Tuscan dialect as a whole has certain defining features, with subdialects that are distinguished by minor details. The Tuscan gorgia affects the voiceless stop consonants /k/ /t/ and /p/, between vowels, the voiced post-alveolar affricate consonant is realized as voiced post-alveolar fricative, /dʒ/ →. This phenomenon is evident in daily speech, the phrase la gente, the people, in standard Italian is pronounced. Similarly, the voiceless affricate is pronounced as a voiceless post-alveolar fricative between two vowels, /tʃ/ →. The sequence /la ˈtʃena/ la cena, the dinner, in standard Italian is pronounced, as a result of this weakening rule, there are a few minimal pairs distinguished only by length of the voiceless fricative. A less common phenomenon is the transformation of voiceless s or voiceless alveolar fricative /s/ into the voiceless alveolar affricate when preceded by /r/, /l/. 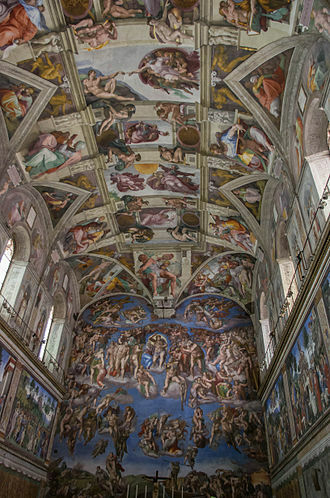 The Sistine Chapel is a chapel in the Apostolic Palace, the official residence of the Pope, in Vatican City. Originally known as the Cappella Magna, the chapel takes its name from Pope Sixtus IV, since that time, the chapel has served as a place of both religious and functionary papal activity. Today it is the site of the Papal conclave, the process by which a new pope is selected, the fame of the Sistine Chapel lies mainly in the frescos that decorate the interior, and most particularly the Sistine Chapel ceiling and The Last Judgment by Michelangelo. In a different climate after the Sack of Rome, he returned, the fame of Michelangelos paintings has drawn multitudes of visitors to the chapel ever since they were revealed five hundred years ago. 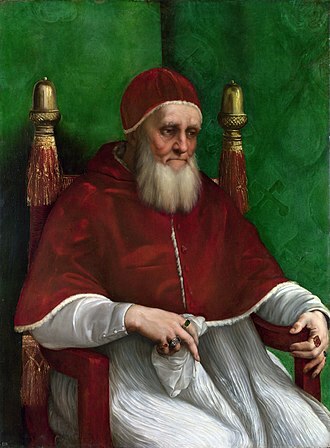 At the time of Pope Sixtus IV in the late 15th century, there were 50 occasions during the year on which it was prescribed by the Papal Calendar that the whole Papal Chapel should meet. Of these 50 occasions,35 were masses, of which 8 were held in Basilicas, in general St.
Peters and these included the Christmas Day and Easter masses, at which the Pope himself was the celebrant. The other 27 masses could be held in a smaller, less public space, the Cappella Maggiore derived its name, the Greater Chapel, from the fact that there was another chapel in use by the Pope and his retinue for daily worship. At the time of Pope Sixtus IV, this was the Chapel of Pope Nicholas V, the Cappella Maggiore is recorded as existing in 1368. The proportions of the present chapel appear to follow those of the original. The first mass in the Sistine Chapel was celebrated on 15 August 1483, the Sistine Chapel has maintained its function to the present day, and continues to host the important services of the Papal Calendar, unless the Pope is travelling. 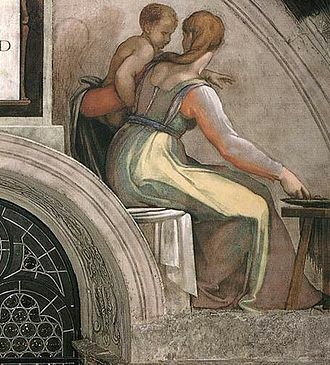 There is a permanent choir, the Sistine Chapel Choir, for whom much original music has been written, one of the functions of the Sistine Chapel is as a venue for the election of each successive pope in a conclave of the College of Cardinals. 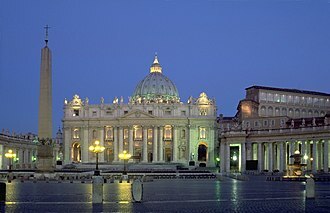 On the occasion of a conclave, a chimney is installed in the roof of the chapel, if white smoke appears, created by burning the ballots of the election, a new Pope has been elected. The conclave provided for the cardinals a space in which they can hear mass, and in which they can eat and pass time attended by servants. 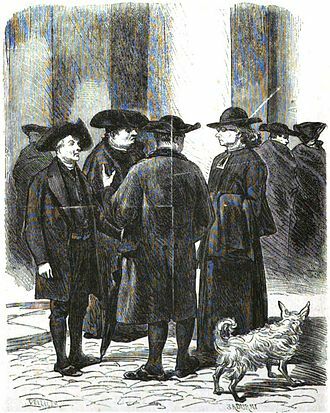 From 1455, conclaves have been held in the Vatican, until the Great Schism, canopies for each cardinal-elector were once used during conclaves—a sign of equal dignity. 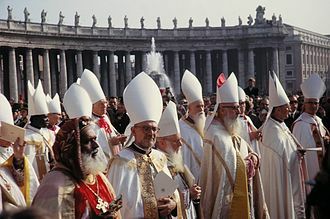 After the new Pope accepts his election, he would give his new name, at this time, until reforms instituted by Saint Pius X, the canopies were of different colours to designate which Cardinals had been appointed by which Pope. Its exterior is unadorned by architectural or decorative details, as is common in many Italian churches of the Medieval and cracking of masonry such as must have affected the Cappella Maggiore has necessitated the building of very large buttresses to brace the exterior walls. The accretion of other buildings has further altered the appearance of the Chapel. The Donation of Pepin in 756 provided a legal basis for the erection of the Papal States, which extended the temporal rule of the Popes beyond the duchy of Rome. In 751, king of the Lombards, conquered what remained of the exarchate of Ravenna, in 752, Aistulf demanded the submission of Rome and a tribute of one gold solidus per capita. Pope Stephen II and a Roman envoy, John the Silentiary, tried by negotiations and bribes to convince Aistulf to back down. When this failed, Stephen sent envoys to Pepin the Short, king of the Franks, with a letter requesting his support, at the time, the Franks were on good terms with the Lombards. 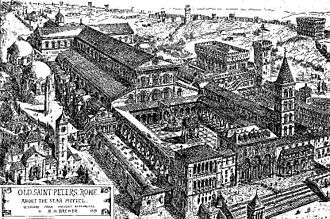 In 753, John the Silentiary returned to Rome with an order that Pope Stephen accompany him to meet Aistulf in the Lombard capital of Pavia. The pope duly requested and received a safe-conduct from the Lombards, with the Frankish envoys who had by arrived, the pope and the imperial envoy set out for Pavia on 14 October 753. 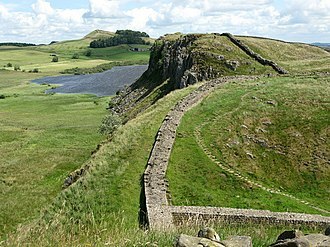 The Roman magnates did not accompany them past the border, John the Silentiary did not accompany them.